Science journalism alumna receives recognition for article on trafficking. 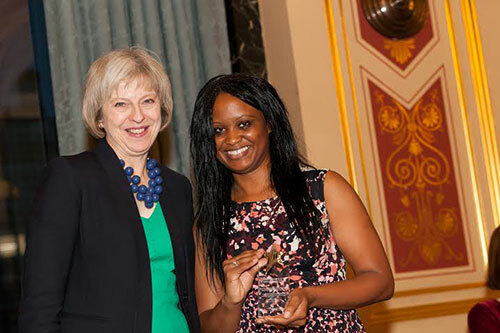 Alumna Jenny McCall (Masters in Science Journalism, 2014) has been presented with an award by Home Secretary Rt Hon Theresa May for an article she wrote about modern slavery. The article, published by openDemocracy, is titled “Just how badly does the UK protect victims of trafficking?” It explores the failings in the National Referral Mechanism, the UK’s system that helps trafficking victims. Jenny was presented with the award at the 2015 Anti-Slavery Day Media Awards held at the Foreign and Commonwealth Office in October. The annual ceremony recognises those who have worked to highlight the nature of modern slavery across the UK. One of Jenny’s intentions in writing the article was to try and uncover the complexities of the National Referral Mechanism. "The system for helping victims of trafficking is a complicated one and currently it plays with people’s lives. I wanted to try and understand the process as it was clear to see it wasn't helping or benefiting people who are trafficked. The Home Office, in some cases were calling victims liars. This is the same government department in charge of border control, some would say that of course it is in their interests to say a trafficking victim was in fact not trafficked. I believe any system that calls in to question the honest testimony of a person who has been found to be abused is a failing one. Jenny graduated in January 2014 and says she is really pleased to have won the award so early on in her career. “It came as a brilliant surprise and I hope to continue doing similar pieces like this. I have learnt so much since starting and the biggest thing is not to follow the crowd. Be driven by stories that interest you as they will more than likely be of interest to others." Jenny now freelances for the Associated Press, alongside Vice News, the Big Issue North and openDemocracy.